Are Hispanic voters being turned away from polling places in the Northeast? Juan “Johnny” Rivera, 31, wears his “Hard Hats for Hillary" outside of his Webster Little School polling place on Frankford Avenue in Tacony. 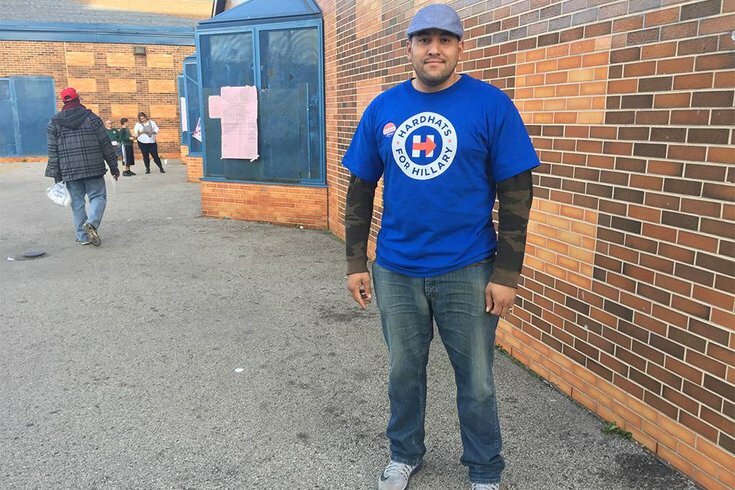 He was asked to leave on Tuesday by a poll worker who insisted he could not cast his vote while wearing the t-shirt. When Juan “Johnny” Rivera showed up to cast his vote on Tuesday at the Webster Little School on Frankford Avenue, the same polling place he’s been voting for the past 12 years, thing got ugly fast. “I always vote here,” said the 31-year-old. But when he told the polling volunteer his name and address on Tuesday, he was informed that he was not registered and should go home. Beyond frustrated, Rivera went from table to table to look for help, thinking that maybe there was a mistake or some sort of confusion. He said he was not about to leave without casting his vote for Clinton in this pivotal presidential election. But that’s when he says Republican Ward Leader Kevin Pasquay grabbed him by the arm. “I took his hand off my arm,” said Rivera, who accused Pasquay of ordering him to remove his t-shirt or to leave the polls. He did neither and that’s when the yelling started, inspiring several onlookers to start filming the incident on their phones. While it appears Rivera kept his cool in the video, Pasquay became enraged – shouting and inexplicably removing the red sweater he was wearing as if to get ready for a brawl. Even when Pasquay was informed by lawyers that there is, in fact, no law banning political apparel like tees and buttons at Pennsylvania polls, he didn’t temper his anger. He was caught in a second video yelling and arguing with both lawyers and voters who were waiting in line, even threatening to call the police at one point before leaving. A call was placed to Pasqual for comment on this story, but the number listed on the ward leader registry was out of service. An email was also sent to Pasqual, but no response was received by publication. “Nobody’s going to chase me out,” said Rivera after the incident. He lives with his wife and three daughters a few blocks from the school. But he was so shocked and upset by the experience, worried that Latino voters are being unfairly targeted at the polls, that he asked a few of his union friends to join him outside the polls to hand out pro-Clinton flyers in their own “Hard Hats for Hillary” shirts. He said they are staying at the polls until they close at 8 p.m. or however long the line is to assist with any other problems that may occur. “They’re denying people the right to vote,” said Rivera. He said his name was eventually found on the rolls and he voted – while wearing his Clinton shirt. As he continued to hand out fliers, a middle-aged Latino woman angrily headed outside yelling in Spanish. It was a little after 4 p.m. when she was told that she was also not permitted to vote. A lawyer standing outside offered to assist the woman, leading her back into the polling place in hopes of finding her name like they did for Rivera – or at least getting her a provisional ballot. This same polling place is also accused of opening one hour and 40 minutes late (at 8:40 a.m. rather than 7 a.m.) because the Judge of Elections allegedly didn’t show up, said Angela Giampolo, a Philly lawyer volunteering as a voter protection attorney in Tacony. “That means we potentially lost those votes unless they come back,” she said on Facebook. A poll worker on duty at 4:15 p.m., who asked not to be identified, disputed Giampolo’s claim. She said that people were voting at 7 a.m. because she was there signing them in. Unfortunately, no records were available to actually confirm the time the site opened. A big question also loomed Tuesday night with less than two hours before polls close in Philly about whether Latino voters in this Northeast neighborhood are being unfairly targeted. Provisional ballots are often used when a voter is unable to locate either a polling place or his/her name in the voting books. These ballots are used whenever an election official asserts that someone is not eligible to vote for any number of reasons (like not having a valid ID or address). All votes cast by provisional ballot are included in the Certified Election Results, according to the Office of the Philadelphia City Commissioners. But it’s not good enough for many voters, like Olga Rodriguez, 43, who showed up at St. Valentine’s Polish National Catholic Church at Margaret and Melrose streets only to be told that she couldn't vote. Rodriguez explained (through a Spanish translator over the phone named Alise Rosario) that she was told she was not registered to vote even though she voted for President Obama eight years ago. At the time, she would have cast her vote at the American Legion on Orthodox Street. This past Memorial Day weekend, however, the legion was destroyed by fire and Rodriguez was redirected to a nearby charter school to vote. Trouble is that when she got to the school, they had no record of her. So she went to St. Valentine’s just a few blocks away in hopes of finding some help. “They couldn’t find her in general registration,” says John Cantoral, an elected majority inspector at St. Valentine’s for the past 20 years. Rodriguez alleged she was treated “badly” by poll workers. She was just about to leave until a lawyer intervened to help her get a provisional ballot. A poll volunteer said she had about 75 provisional ballots this morning. “I’ll be lucky if I have five left,” she said. Rodriquez ended up spending about two hours at the polls before finally filling out her provisional ballot. Another Latino, an older male, was also having trouble voting this afternoon at St. Valentine’s, though he seemed to have more luck because he had a voter ID card with him. Only when “it got heated” between the lawyer and the poll workers did Rodriguez even get a provisional ballot.